4: displays the gear engaged in manual mode. Note: Press the button 2 to go from position D or N to R or P.
With the selection lever 1 in position P, switch on the ignition. 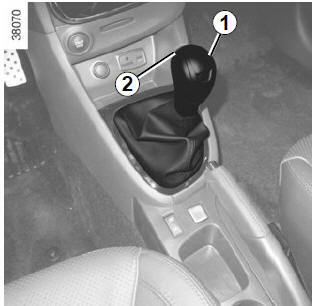 To move out of position P, you must depress the brake pedal before pressing the unlocking button 2. With your foot on the brake pedal (warning light 3 on the display goes out), move the lever out of position P.
Only engage D or R when the vehicle is stopped, with your foot on the brake and the accelerator pedal released. 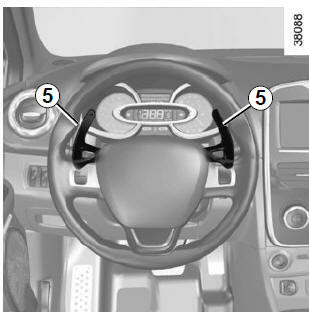 The paddles 5 enable you to change gear while the gear lever is in ‘manual mode’ position or, if driving, in ‘automatic mode’ position. P, N and R are not accessible using the paddles. 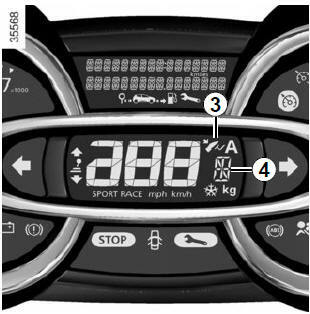 The display 4 notifies the driver about the current mode and gear. Put lever 1 into position D.
In most road conditions you will encounter, you will not need to touch your lever again: the gears will change automatically at the right time and at the most suitable engine speed because the automatic system takes into account the vehicle load and road contour and adjusts itself to the particular driving style you have chosen. When driving, always leave the lever in position D, keeping the accelerator pedal lightly depressed to ensure automatic gear changes at a lower engine speed. Depress the accelerator pedal firmly and fully (so that it goes beyond the kickdown point). This will enable you to change down to the optimum gear within the engine range. With the selector lever in position D, move the lever to the left into the M position. to move up through the gears, push the lever backwards or press the right-hand paddle. The gear selected is displayed on the instrument panel. In certain driving conditions (for example, engine protection, operation of the Electronic Stability Programme: the automatic system may change gear automatically. Likewise, to prevent incorrect manoeuvres, a gear change may be refused by the automatic system: in this case the gear display flashes for a few seconds as a warning. If the bends and road surface do not allow you to stay in automatic mode (e.g. in the mountains), we recommend that you change to manual mode. This will prevent the automatic gearbox from changing gear repeatedly when climbing, and permit engine braking on long descents. When facing uphill, to remain stopped, do not keep your foot on the accelerator. Risk of overheating the automatic gearbox. 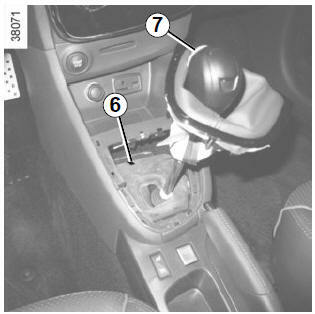 When the vehicle is stopped, move the lever to position P while keeping your foot on the brake pedal: the gearbox is in neutral and the drive wheels are mechanically locked by the driveshaft. An impact to the underside of the vehicle while manoeuvring (e.g. : striking a post, raised kerb or other street furniture) may result in damage to the vehicle (e.g. : deformation of an axle). To avoid any risk of accident, have your vehicle checked by an approved Dealer. when driving, if the “CHECK AUTO GEARBOX ” message appears on the instrument panel, it indicates a fault. If a vehicle with an automatic gearbox breaks down, refer to the information on “Towing” in Section 5. For safety reasons, do not switch off the ignition before the vehicle has come to a complete standstill. When setting off, if the lever is locked in position P even though you are pressing the brake pedal, the lever can be released manually. To do this, release the base of the lever, then use a tool (rigid rod) in the slot 6 and simultaneously press button 7 to unlock the lever. Contact an authorised dealer as soon as possible.